Paul Davis announced his retirement from professional basketball with a statement in the official site of Khimki Moscow, the team with which he spent the last four seasons of his career. The 31-year old American center struggled with many injuries in recent years, something that obviously played a big part in taking the decision for such an early retirement. These troubles have taken a toll on his body and prevented him from performing according to his strengths. 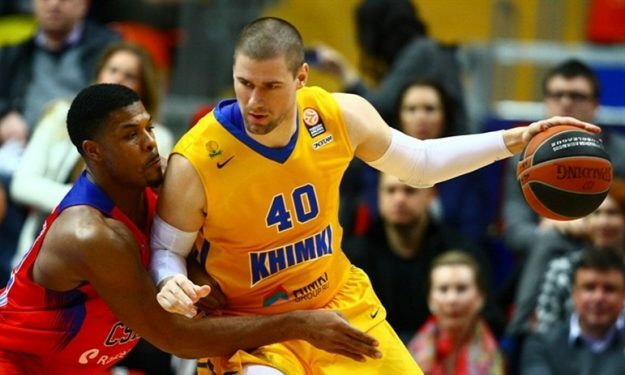 “When I started at Khimki I didn’t realize how great the club was or could be. It meant more every year I was in Khimki to help the club grow for the fans and the future. Most of all I liked my teammates through the years. The Russian players and fans welcomed me with great attitude and I made life long friends. The city of Moscow is great. It will always be a second home. I just want to say thank you to the fans for sticking with me through the years and my injuries. I literally gave have everything I had to Khimki and the fans were always behind me all the way. A lot of it was bad luck with injuries. I always tried to give everything I had every game and I think it showed. My favorite memories were in the locker room and traveling with the team. I always liked home games and coming into the arena with our fans. And of course winning the Eurocup on the Khimki floor. I’ll remember the city and people of Moscow. The support of the fans and colors blue and yellow I’ll keep forever. I am retiring from sports. My body cannot play anymore even though my mind could. Right now I will just enjoy being around family and friends and start to be a fan of sports instead of a player. Thanks. Paul”.